Blog Quick Quotes: Stackable Flowers + Giveaway! Today's project features the Stackable Flowers Bag o' Chips! Good Sunday Morning to you! It's Barb and I am back to share a layout I created with the Dreamscape line. 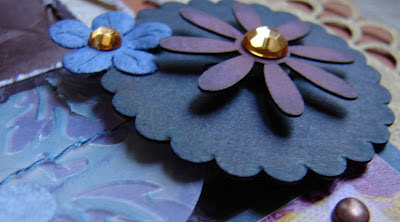 I love this line of paper... the yellows with the purples and blues are gorgeous! These pictures were taken on a recent trip to Cabo. The flowers are from the Quick Quotes Bag 'O Chips - Stackable Flowers. I used my PowderPuff Chalking Inks in Mango Mai Tai, Blue Moon, Very Berry and Purple Passion to color the flowers. I then added foam adhesive between the layers to give it even more dimension. The banner that is draped across the middle of my layout was easy to make. I ran a piece of vellum through my embosser, cut out the circles and then inked them up! I used the PowderPuff Chalking Inks for this.... Blue Moon on one side, Purple Passion on the other. I then stitched them together with my sewing machine to make the banner. I hope you have a wonderful Sunday and you get to spend some time with family and friends! Who would love to win some Chipboard Laser Die Cuts? on our Chipboard Laser Die Cuts! Comments will be collected over this weekend and the winner announced Monday. Love the layout-really cute flowers! I think I would like to try the chalking technique, I saw it a couple times this week and like the results! Wonderful layout! I like chipboard pennant pieces. The flowers and the vellum treatment on your LO are just adorable!! A technique I love to use with QQ chipboard is using a small patterned stamp (like a swirly flourish or scroll) on a frame or border, then ink it up with another color! you already hit upon my favorite technique - chalking. i just love my powder puff chalk inks. just waiting for a coupon to add to my collection. I'd love to see some techniques with embossing and chalking. 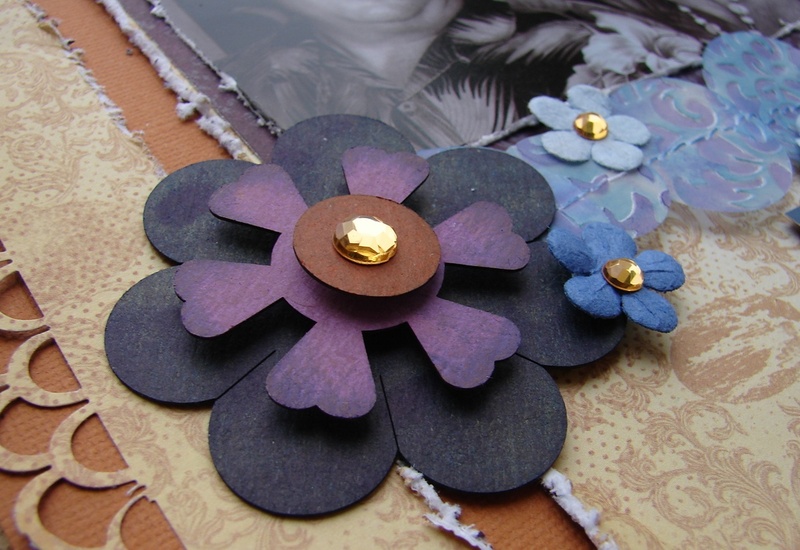 I'm love learning something new and I've used only a bit of chipboard. Loving this thank you. Can't wait to try this idea and really play. Very pretty! love those flowers! The chalking is a technique I am still learning so more of this is inspirational & encouraging to me. Thanks for giveaway chance. Wow I love the layered flowers and the chalking , the first time I have seen this, would love to see more, thank you. Really cute project! I would like to see some embossing used on the chips. I also like to cover them with different patterned papers. How about crackle paint or embossing type designs. I don't use chip board often and any help with this is great? How about techniques with crackle paint? I love using your inks on chipboard. Chalking inks...... Love using that on chipboard! It would be nice t see different inking techniques. Barb ~ this layout is gorgeous!!! I love the inking you did. I would love to see different inking techniques on the chips!! Love the layout, I like the Chalking inks and would like to try some gliter. Love the layout, I like the Chalking inks and would like to try some gilter. I love seeing how the different shapes are stacked to create different flowers. I also enjoy the different methods of coloring them. Great flowers. Would like to see them misted.